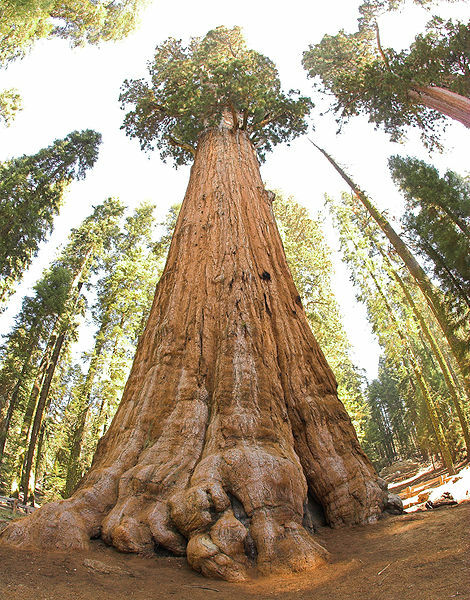 General Sherman, the world’s largest tree by volume, and not (sadly) an Ent. Wikimedia Commons. The simple story of the last 2.5 million years of vegetation response to climate change could be summed up like this: temperature goes up and down, plants go back and forth. We’ve had over a dozen ice ages and interglacials since the beginning of the Quaternary Period. In response, flora and fauna are repeatedly displaced by the expanding ice sheets and changing climates. As carbon dioxide concentrations approach 400 ppm (any day now) for the first time since the mid-Pliocene, ecologists and conservation biologists turn to the paleorecord to get a sense of how well plants can track their optimal climates. Because trees are important foundational species, slower-growing, and make up a large proportion of both modern biomass and the fossil pollen record, most research on plant migration rates has focused on these charismatic megaflora. Trees are sessile; unlike Birnam Woods in Macbeth, individual trees don’t move. When paleoecologists talk about tree migration rates, we’re referring to changes in the overall distribution of species in response to changes in climate or other drivers. You can check out animated maps of the changing distributions of trees going back to the end of the last ice age here (based on work my advisor, Jack Williams, did for his dissertation). A lot of the pioneering work on this subject was done in the 1960’s, 70’s, and 80’s by Margaret Davis and Tom Webb (my grand-advisor! ), who mapped the distributions of trees from fossil pollen data following the retreat of the ice sheets. This early work showed that trees moved individualistically in response to climate change– that is, that species of trees, not communities of forests, tracked their climatic niches at their own rates and along their own trajectories. At the timescale of millennia, these range shifts were largely in equilibrium with climate, and most species seemed to have had no trouble keeping up with the warming temperatures as ice sheets retreated. The answer to the “how fast can trees migrate?” question therefore appeared to be “fast enough” — in fact, migration rates for North American trees were estimated to be from 100-1000 meters a year, which certainly seemed fast enough to keep pace with future warming. 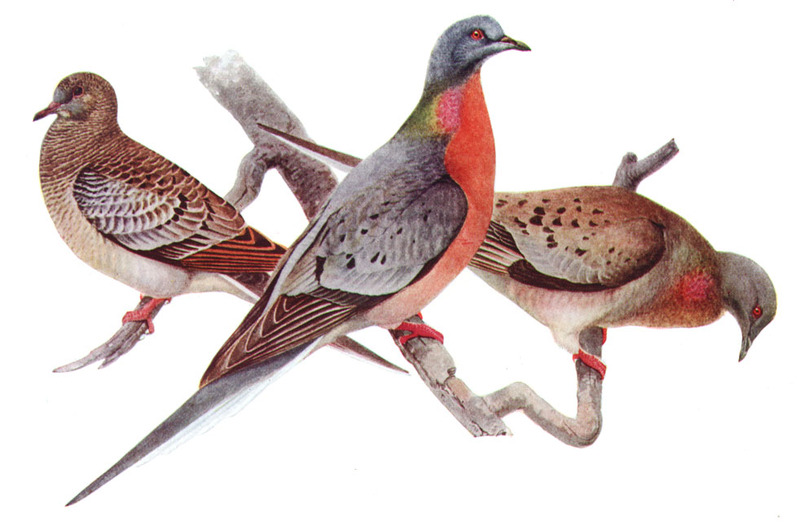 The extinct passenger pigeon may have played an important role in the dispersal of some plants. Wikimedia Commons. Another explanation is that small, “cryptic” populations of trees may have been growing quite close to the ice sheets, undetected in pollen records. Jason McLachlan, a former graduate student of Clark’s, used evidence from modern population genetics in American beech and red maple to show glacial refuges may have been located much further north than the previous, pollen-based estimates. The areas of highest genetic diversity for those species today are located within 500 km of the ice sheets’ southernmost point, which McLauchlan and colleagues interpreted as being the genetic fingerprint of past refugia (as populations from across eastern North America were squashed together in a smaller area by the advancing glaciers). In other words, the starting line for migration may have been >1000 km further north than previously thought, which means that trees wouldn’t have had to migrate nearly as quickly to reach their modern distributions. According to McLachlan’s estimates, the migration rates were <100 meters per year, as much as an order of magnitude slower than previously thought. A new study by Alejandro Ordonez and Jack Williams** looks at the biotic velocities (km/decade) of the northern and southern range limits of 30 tree species since 17,000 BP, following Scott Loarie‘s influential study on climate velocities. They found that northern (leading) edges expanded more rapidly than southern (trailing) edges, and that tree velocities were as fast or faster than the climate velocities for the same interval. They found that not only were tree range shifts paced by climate change in general, but that biotic velocities were faster when climate change was more rapid. Populations at the leading edge were more sensitive than the trailing edge to climate change, suggesting that expansions were climate driven but mortality at the trailing edge was affected by non-climatic factors like biotic interactions. As Ordonez and Williams note, their velocity estimates (-1.7 to 2.7 km/decade) are on the low end of previous pollen-based estimates (1-10 km/decade), but slightly higher than those estimated by McLachlan et al. (<1km/decade). Meanwhile, Loarie’s climate velocity estimates for the next century are higher, ranging from 0.8 km/decade to 12.6 km/decade. To complicate matters, species have been documented to reach average velocities of 6.1 km/decade or 16.9 km/decade in response to the climate change observed in the last few decades. 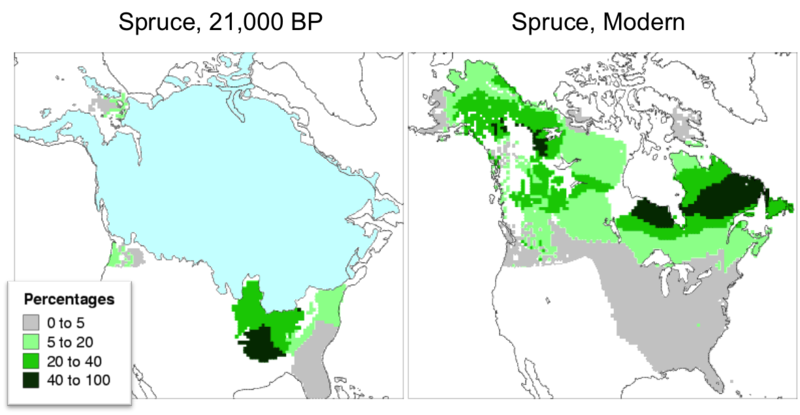 Pollen abundances showing the distributions of spruce at the last glacial maximum (left) and today (right). Modified from Pollen Viewer, courtesy of Jack Williams. Which migration rate estimates should we believe? I do think that there are opportunities to revisit the pollen record to get a better handle on this, particularly since we’ve seen major improvements in dating, increased temporal resolution of records, and lots of spatial gaps filled in. I’m not completely convinced by the molecular data, in part because work in Europe on modern population genetics have shown that areas with high genetic diversity are mixing zones where different migratory populations crossed, rather than locations of refugia. Another study suggests that some species of trees are dispersal limited and may not even be in equilibrium with climate now, but are still making their way northward more than 10,000 years after the ice disappeared from continental Europe. Pollen data–as currently interpreted– may be poorly suited to capture range shifts at short (centennial) timescales, but there also may be fresh ways of analyzing that data. Amidst all of these questions is concern is that future estimates of climate change are faster than those observed in at least the last 21,000 years, and so trees may not be able to keep up regardless of whether we follow the pollen or the genes. Whether trees migrate quickly or slowly (both in the past and in the highly fragmented, faunally depauperate present) may affect where trees fall on the concern pendulum: is there cause for optimism, or alarm? When faced with climate change in the past, trees either migrated or went extinct. In the future, there’s a third option: managed relocation, the deliberate movement of species to help them track their habitats. The natural experiments of the past can help determine what we can expect trees to do in response to projected climate change, and whether, like in Macbeth, we’ll need to move the wood. * As it turns out, I’m not the first person to think of Birnam Wood when it comes to tree migrations. After writing this post, I learned of a nice little piece by Keith Bennett. **My former labmate and graduate advisor, respectively. Excellent post. I just added it to a long list I keep updated of papers etc on assisted migration here: http://www.torreyaguardians.org/assisted-migration.html Question: What about the warm-adapted genotypes that may prevail at the southerly range edges — and that might therefore “cost” the species a great deal by winking out, even as the northward margin survives and moves ahead? Palynologist Hazel Delcourt (author of “Forests in Peril”) mentioned this to me just before she retired, and it has been haunting me ever since. Note: Paul S. Martin was my mentor, and he was quite happy to accede to Hazel and others the paradigm shift of individualistic migrations, which overthrew the community-style movements he had contribute to. Also, check out my new video of 4 climate scientists by searching on youtube for the title “Hot Climate Women Scientists in Cool Places” (Julie Brigham Grette, Jennifer Franices, Natalia Rybczynski, and Lisa Graumlich. I guess it’s more of managed relocation these days. In our vicinity we see species from australia and africa outnumbered the trees that originate from here in last 2 decades only. Don’t know it’s good or bad.. but it did help economically for many people.